During the first meeting with the client, the idea for the house was simple: it should be modern. However, this concept in itself is a bit too vague to start a project! For this reason, the architect decided to build a low-cost house that could satisfy the owners' needs on a long-term basis. The priorities were simplicity in design, execution and construction. The dwellings that surround this house are very different in terms of shape and size. 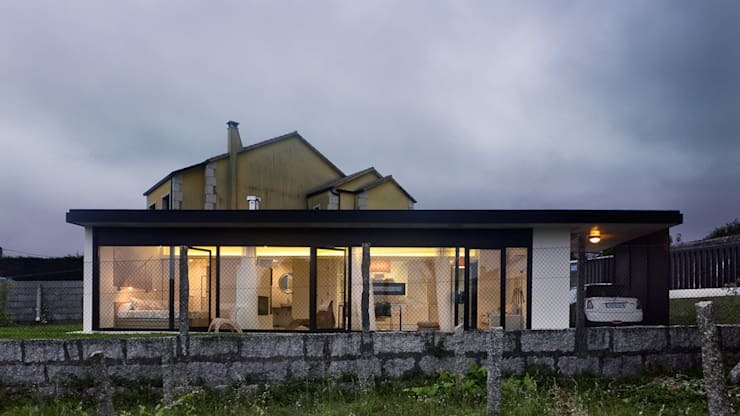 The first priority was to open the house to the south and keep the facade discreet. The home was developed from a concrete slab that seems to 'float' over the southern façade in order to protect the large windows from summer sun. In terms of design, the rooms are spacious and the large windows at the back connect with the exterior grounds. 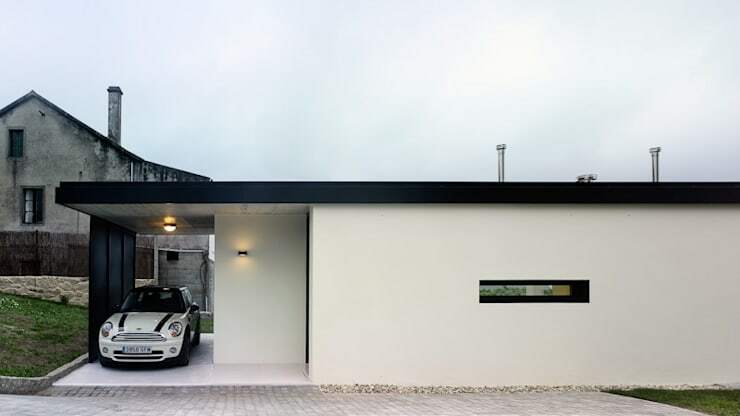 In this photo we see the main facade, utterly simple and minimalist in design. There is nothing dazzling, such as an opening that lets in natural light. In this way, the privacy of the residents is protected. The entrance is spacious and allows the parking of a car, a practical aspect for the owners. The rear of the property is totally different! This part is completely glazed, as opposed to the almost entirely enclosed front; an idea based on privacy and security that you can reproduce in your home if the front is facing the street. The large glazed area lets natural light pass through and allows residents to enjoy the landscape at the rear. Inside, rooms link with each other and light flows easily between them. Dispensing with interior walls and choosing integrated spaces is the ideal solution, especially for small homes. The house immediately looks bigger. Imagine if, in this house, walls had been erected to separate each division… It would become dark and impractical. Instead, look at this picture: does it look like a 50sqm house to you? No! In addition, it is much easier to furnish the open space. In this case, they opted for modern and minimalist decoration, simple lines and great comfort. 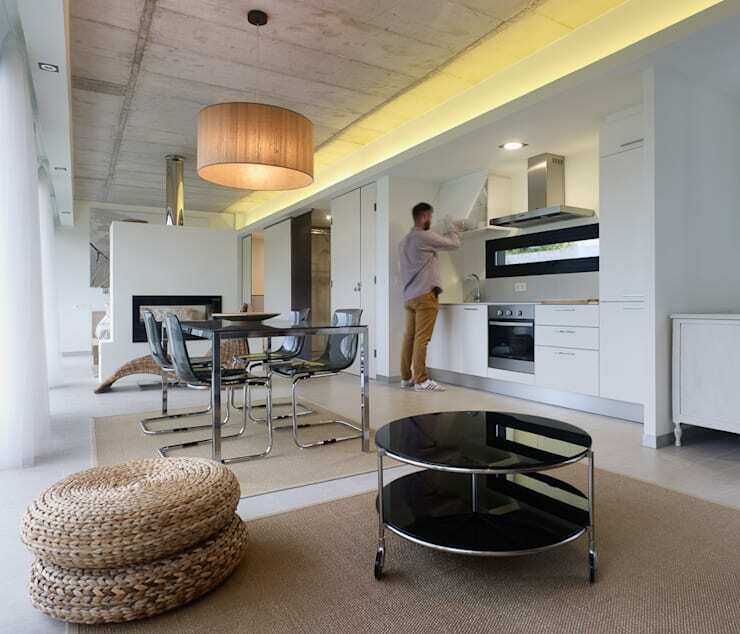 For more examples of stylish, low-cost homes, check out this Ideabook. 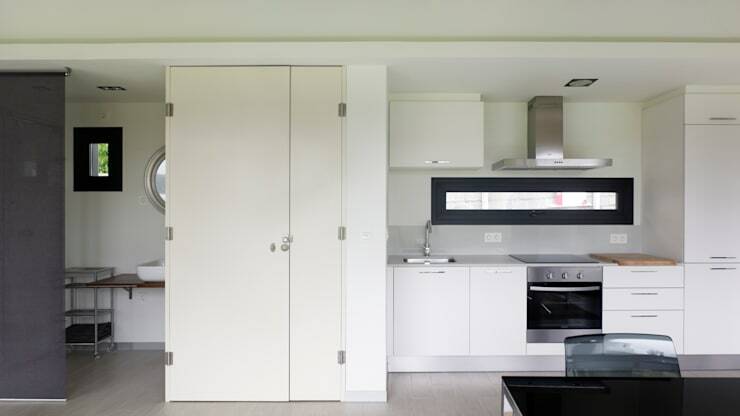 At homify , we often present homes with open-plan, multifunctional layouts. Here, this space comprises the kitchen, a small closet and, next to it, the bathroom. The white palette offers homogeneity and continuity between each area. White is the ideal colour for spaces with limited dimensions. One could easily personalise the terrace by adding some design features and decorations. Can you imagine living in a minimalist one-storey home like this?